Lindy Lee was closely associated with appropriation practices in the 1980s and into the early 1990s. Lee's most well known works from this period used photocopied portraits and faces from the 'masterpieces' of Renaissance art, overlaid with veils of paint. Through repeated copying, faces would emerge and submerge into inky blackness. This suggested both cultural distance from the iconic original works and our experience of them through ubiquitous reproductive technologies. At the same time, Lee's work retained something of the aura of the original through showing just how much beauty could be retained in this repeated, copied and reworked state. Questions of cultural authenticity took on a more personal note in Lee's art from the mid-1990s when she began incorporating portraits of immediate family members into her work. In 'Virtues of the Receptive' Lee has included a portrait of her grandmother. Lee's experience of being Chinese-Australian and how this may have influenced her earlier exploration of cultural distance became the subject of her practice. 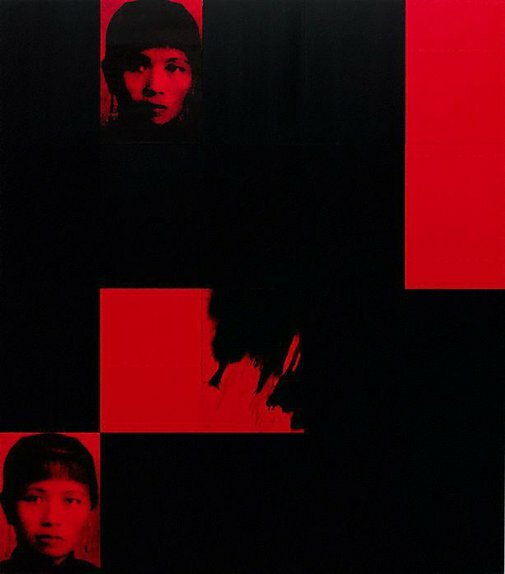 The near abstraction achieved in some of her earlier works, when the portraits became photocopied into an almost total erasure of the image, was explored further by Lee from the mid-1990s. 'Virtues of the Receptive' includes monochromatic panels as well as a single gestural panel in which black ink bleeds down the red background. Colour is symbolic for Lee, with black indicating mystery and causation and red representing the carnal and the corporeal. Purple, as a mix of these colours, combines these elements. The thrown ink of the single gestural panel is often created by Lee while in a meditative state, a physical expression of Zen Buddhist spiritual practices. Michele Helmrich, Lindy Lee: the dark of absolute freedom , 'From darkness to light: pathos and reverie in the work of Lindy Lee', pg. 15-44, Brisbane, 2014, 25, 94 (colour illus. ), 121, 140. Wayne Tunnicliffe, Contemporary: Art Gallery of New South Wales Contemporary Collection , 'Cultural memory, critical distance', pg.154-203, Sydney, 2006, 178, 179 (colour illus. ).